Whether your smile looks a little faded from the usual wear and tear of daily life or has more complex issues such as crooked, chipped, or gapped teeth, Dr. Olsen can provide cosmetic dentistry services to correct all of your smile imperfections. Don’t hide your smile for fear that others will notice the dental damage or irregularities that make you feel self-conscious. Treat yourself to a new smile designed by Dr. Olsen. To get started, contact us today for an appointment. They are extremely thin ceramic coverings that are attached to the front of the teeth to improve their appearance in every way. You can get one to enhance a single tooth or an entire set to achieve a dramatic smile makeover. They are custom-made for every patient, so the only limit is your imagination. 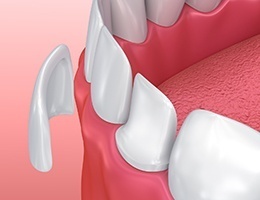 Having to hide damaged or decayed front teeth is no way to go through life, so our team is prepared to help you with natural-looking all-porcelain restorations. Dental porcelain can be shaped and shaded to perfectly mimic real enamel in every way, all the way down to how it reflects light. This material is so lifelike that even YOU will have trouble seeing where your real tooth ends and the restoration begins! Tired of that one small stain, chip, or gap ruining your entire smile? So are we! With direct bonding, Dr. Olsen can get rid of these kinds of minor flaws faster than ever. Using a naturally-colored composite resin, he can build up damaged/missing tooth enamel and then sculpt away all of a tooth’s imperfections. The entire treatment usually takes less than an hour, is completely painless, and the results can be trusted to last for about 10 years! 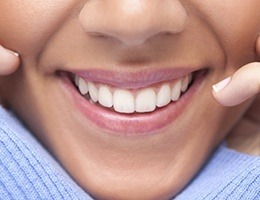 Are stained or darkened teeth making you more hesitant to smile? With our custom-made whitening kit, we can help you make your smile up to 8 shades brighter while you simply relax at home. 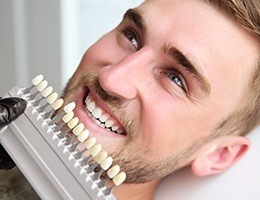 We’ll create specially-designed trays that will comfortably fit your teeth and keep our powerful bleaching gel in place, one that is much stronger than anything you can buy on your own. After just two weeks of daily use, you’ll see dramatic results! Do you have an uneven gum line that throws off the look of your smile? Or, do your teeth appear short or stubby because of overbearing gums? If so, we can use our soft tissue laser to quickly correct both issues. With it, Dr. Olsen can painlessly reshape your gum line and remove excess tissue to expose beautiful, previously hidden dental structure. He can help you achieve that perfectly proportioned look over the course of just one easy appointment. With Invisalign and ClearCorrect, we can straighten your teeth in the most discreet and comfortable way possible. Instead of wires and brackets, these systems instead use a series of crystal-clear aligner trays to gradually shift the teeth. 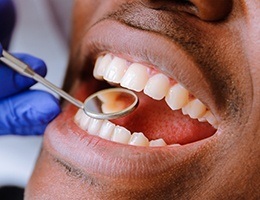 The trays are practically invisible when worn on the teeth, and even better, you can simply take them out whenever it’s time to eat or brush. In the end, the only thing people will notice are your beautiful results!